Apparatjik will be performing at the opening of the new concert house in Fosnavåg, Norway, on October 23rd. This was announced at a press conference today. They will be joined by The Norwegian Radio Orchestra for a special performance of music made by movements captured on surveillance cameras placed around Fosnavåg – similar to the “Everybody is a composer!” project in 2012. This news follows an announcement on the official Apparatjik website – “Everybody is clapping!” – where they invite fans to record video clips of themselves clapping their hands, to be used in connection with a new recording project. Apparatjik’s last performance was in Copenhagen in May 2013. We were originally reluctant to confirm new dates before we knew for a fact that Morten’s throat is back in shape. This because we did not want to risk another cancellation and disappointing you all once more. However, it looks like Morten’s voice is already well on its way to recovery. Adding to the fact that the only date available for Olympia this year is July 5, we feel that it is the right choice to welcome this opportunity. Read the whole update on mortenharket.com. Morten’s next performance was supposed to be in Kristiansand on June 7th, for TV2’s new summer show “Sommer i Dyreparken”, but he has now been removed from the list of scheduled guests. Unfortunately, Morten’s concert in Paris yesterday could not go ahead as planned, due to a throat infection. 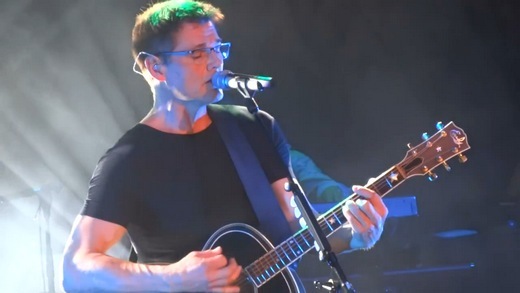 After a 30-minute delay, Morten himself came on stage at l’Olympia to announce that the concert would have to be rescheduled. “I am so sorry guys. I have no voice to sing with. So I don’t know what to do”, he told the crowd. “I have been looking forward to this so much, and I’m just really sorry that it’s simply not possible tonight. (…) I also have a great band with me and they are just gutted, because they were so looking forward to playing here tonight. And this has happened so fast. 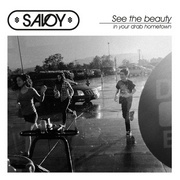 (…) So when I see you next time I’m gonna be back here, and it’s gonna be the same as this, as much as we can. 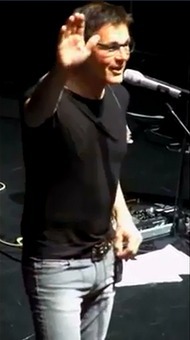 (…) So let’s agree on a date, and it’s gonna be a date”, Morten said. There’s a video of his speech on YouTube. Due to his throat infection, tomorrow’s concert at Shepherds Bush Empire in London will also have to be rescheduled, management announced today on Facebook. “New dates will be announced as soon as possible, and tickets for May 14 and 16 will be valid”. A message from Morten has also been posted. 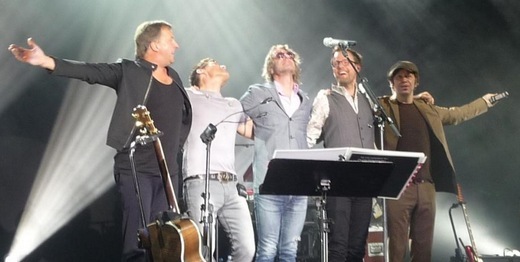 Morten played the fourth and last concert in Germany on Friday, at the Capitol in Offenbach. The setlist appears to have been the same at every show so far. Check out the YouTube videos – some really good performances here! “I was at a garden centre somewhere in England and was standing in line to pay. Suddenly I hear a voice saying “Hey Morten” and I’m thinking ‘oh great’, now I’ll have to turn around and face some guy I don’t recognize and that’s never any fun. Instead I’m staring straight at Jimmy Page, standing there with his hand stretched out and saying “Jimmy. Jimmy Page”. And I just say: “Yes you are, aren’t you”. It was quite unexpected”, he says with a laugh. Later they’ve met each other several times. “He’s a really great guy. I was surprised by how well he knew a-ha’s music. 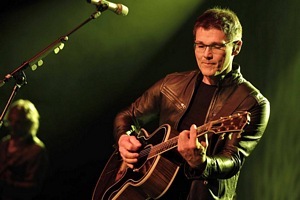 And just like me he collected butterflies and insects, but he had a considerably larger guitar collection than me”, Harket says with a smile. Per Lindvall, Morten, Lars Danielsson, Christer Karlsson and Peter Kvint. The third concert of Morten’s Brother tour was held at the Columbiahalle in Berlin yesterday, with around 2000 people in the audience. Offenbach is the last stop in Germany tonight, before the tour moves on to Holland, Belgium, France and the UK. Several fans have asked for details on new merchandise, but there doesn’t seem to be any merch for sale, at least not in Germany. 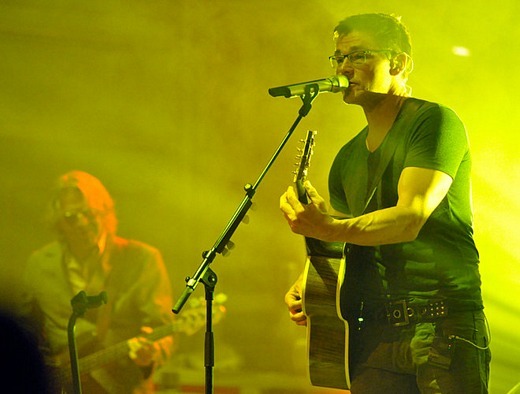 The tour continued in Cologne yesterday, where Morten and his band played for around 1000 people at the E-Werk venue. The setlist appears to have been the same as in Hamburg. YouTube live videos posted so far include Do You Remember Me, Oh What A Night, Darkspace, Whispering Heart and Let It Be Me. If you look at the video of “Darkspace”, you’ll notice Morten has altered some of the lyrics since he last performed the song in 2008. There is also a photo gallery from Cologne at ruhrnachrichten.de and review at rundschau-online.de. Meanwhile, “Brother” climbs from #19 to #15 in its third week on the German album chart. Morten on stage at Laeiszhalle last night, with Lars Danielsson (left). 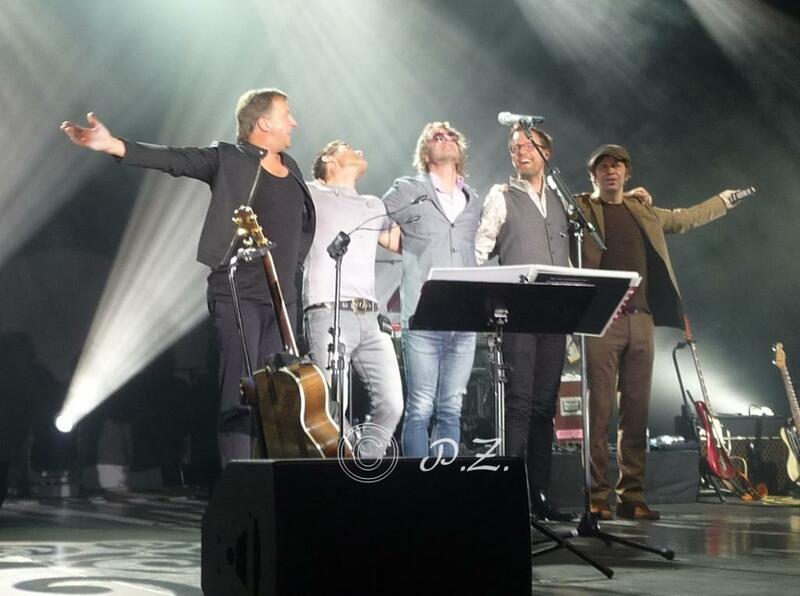 Morten’s 2014 solo tour opened at the Laeiszhalle in Hamburg, Germany last night. He was backed by Per Lindvall (drums), Christer Karlsson (keyboard), Peter Kvint (guitar) and Lars Danielsson (bass). “We had a great great time – thanks to all you wonderful fans!”, Peter Kvint said in an update on his website. Update: A video of the whole concert has now been posted on Vimeo. This means the setlist included 7 songs from Brother, 5 songs from Wild Seed, 3 songs from Letter From Egypt, 1 song from Out Of My Hands, 1 unreleased song (“Did I Leave You Behind”) and 1 cover version (“Let It Be Me”). 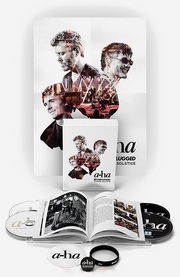 No a-ha songs this time, thankfully! Three of the songs had their live premieres last night; “Oh What A Night” and “End Of the Line” from Brother and “Should The Rain Fall” from Letter From Egypt. 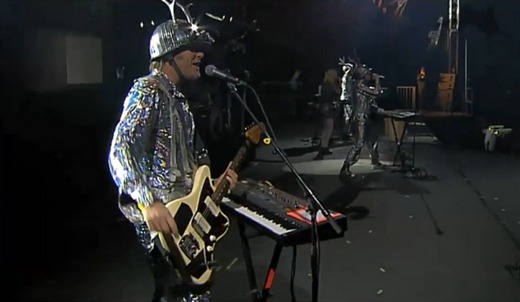 In addition, “Darkspace” and “Shooting Star” were played live for the first time since 2008. Five of the songs (“Spanish Steps”, “When I Reached The Moon”, “Lay Me Down Tonight”, “Wild Seed” and “A Kind Of Christmas Card”) were also performed on the 2012 tour. There is a photo gallery from the concert at oldie95.de. Morten, Karl Oluf and Dan on Lindmo, May 3rd. Morten was a guest on the NRK1 talkshow Lindmo yesterday. The show was taped in Oslo on Friday. In addition to being interviewed, he did an acoustic version of “Do You Remember Me” with Dan Sunhordvik and Karl Oluf Wennerberg. The show can be viewed at tv.nrk.no. There is also a photo gallery and a backstage clip from the taping on Facebook. Morten was also a guest on the German talkshow Geht’s noch?! Kayas Woche, hosted by comedian Kaya Yanar, on Friday. The RTL show, which was taped in Cologne on Thursday, is available here – but can’t be viewed outside of Germany. There is also a bonus clip at rtl.de and a video greeting from Morten at kaya.tv. On the Norwegian album chart, Brother is down to #2 in its third week, after spending two weeks at #1. In Germany the album fell from #11 to #19 in its second week, while it disappeared from the Top 100 in both UK and Switzerland after only one week. BTW, Dan Sunhordvik has posted a photo gallery from his promo work with Morten this spring on Facebook.